We are proud to announce that Coronado at Aliso Viejo Homeowners Association has selected Tinnelly Law Group as their association’s legal counsel. 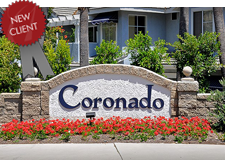 Coronado was built in 1994 by Lohn Laing Homes in the City of Aliso Viejo, which is known for its rolling hills, low crime, clean air, and close proximity to the beach. Residents enjoy using the community pool, spa, and a central greenbelt. Our HOA attorneys and staff look forward to working with Coronado at Aliso Viejo’s Board and management.